thority has concluded plans to rid off rickety trucks from entering any of the Lagos ports. The port manager, Lagos port, Mallam Nasir Anas Mohammed who disclosed this to our correspondent urged all stakeholders to support the NPA management as to reduce the falling of containers on innocent road users and incessant breaking of trucks on Lagos road. The Lagos Port boss, last week in Lagos explained that plans were in the final stage to stop trucks that do not meet the minimum standards required of them for operating at the ports. “We want to put it on the front burner this year, because we are not happy seeing trucks breaking down on the roads everywhere around the country. Mohammed, who emphasized the essence of the management stands, said disaster do not warn, thus the need for adequate preparation by ensuring stakeholders co-operate with the NPA management decision. According to him, “This is in consonance with the federal government position on vehicles inspections and other unwholesome practices not only within the ports industries but within the country at large. 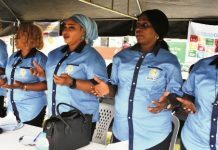 The Lagos Port boss, noted that Vehicle Inspection Officers (VIOs) and operatives of the Lagos State Command of the Federal Road Safety Corps (FRSC) would be fully involved in enforcing the trucks minimum standards. According to him, “this departments are the critical stakeholders and we realised that we have not engaged them, but now, they must be carried along, because they are the one expected to regulate the activities of the truckers and their trucks. The timely intervention of stakeholders like shipping companies, clearing agents, haulage companies who argued that they need an extension to comply, the implementation was relaxed in the last quarters of 2014. “We set out to achieve full implementation but along the line, we had request and complaints from critical stakeholders. We collectively agreed to step down the policy with the understanding that the full implementation will take off in 2015. He said that there would be no going back on the full implementation this year as no amount of appeal or excuse would stop it. Nasir Mohammed, appealed to stakeholders to imbibe safety strategies and be security conscious in their operations, noting that it was priority in current international ports operations.